Russian stocks pushed higher on Wednesday with firmer crude prices helping Russian energy companies, in light and choppy trade. 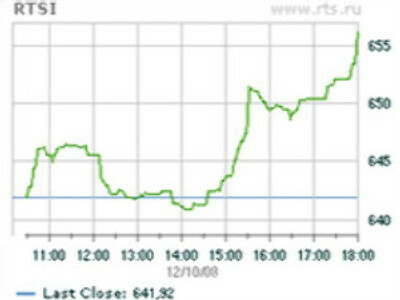 At the close the RTS had gained 2.21% to finish at 656.13 with the Micex adding 1.78% to close at 618.64. Crude prices got a pick up from comments by Russian Energy Minister Sergei Shmatko signaling that Russia would unveil crude output cutback measures on December 17, while adding that OPEC ‘Has serious plans in relation to a reduction.’ Late in the day the sting was taken out of those comments by the U.S. Energy Department, who unveiled data showing a surprise rise in U.S. fuel inventories, but that still left the Brent and WTI spot prices and Nymex futures crowding about the $44-45 BBL mark. That saw good gains for Rosneft (up 7.83%), Gazprom-Neft (up 5.77%) and Lukoil (up 4.37%), with Surgutneftegas (up 1.41%) also climbing more slightly. Gas suppliers dipped out on the bien etre in the wake of reports that the Government may back away from plans to allow them to increase their tariffs by as much as 19% next year. That held Gazprom (down 0.01%) to the barest of downsides, but saw Novatek (down 4.53%) add to its Tuesday hammering and Ritek (1.92 %) also lower. Base metals got a boost through the day, on an easing U.S. dollar as well as increasing sign that there will be a bailout package through Congress for the American car industry soon, while gold also pushed above the $800 an ounce mark. That saw upside for Norilsk Nickel (up 2.11%), Polyus Gold (up 2.15%), and Polymetal (up 1.77%). The bouncing steelmaking twins – NLMK (down 1.18%) and MMK (up 0.37%) – who have managed double digit percentage movement more days that not lately, managed to limit movement to what for them must have seemed boring, while Severstal (up 2.20%) edged higher. Raspadskaya (up 4.21%) chalked up a solid gain, with Uralkali (up 0.88%) higher, and counterpart Acron (up 7.3%) getting a good boost. In the financial sector VTB (up 2.22%) and Sberbank (up 0.42%) gained while smaller rivals Bank Moskvy (down 0.91%), Bank Vozrozhdenie (down 1.73%), and Rosbank (down 3.31 %) all closed lower. Trade in the retail and consumer goods world saw Wimm Bill Dann (down 6.10 %) and rival drink maker Lebedyansky (down 1.28 %) both close lower, with retailer Magnit (up 3.53%) getting a handy boost while upmarket rival Sedmoi Kontinent (up 0.57%) had its gain limited by its 3Q results, and grain producer Razgulay (down 3.51%) closed lower. Also down mildly were retail chemist chain Pharmacy 36.6 (down 1.53%) and beauty products maker Kalina (down 0.07%). The days play for the telecoms was led by Rostelecom (up 9.17%) and MTS (up 4.98%), with regional players CenterTelecom (up 0.02%), Volga Telecom (down 1.21%), Uralsviyazinform (up 1.14%), Dalsvyaz (down 1.54 %), and Southern Telecom (up 2.39%), not straying too far from the starting mark. Elsewhere, Aeroflot (up 4.98%) picked up thrust from delivery of its first Airbus 330, while automakers Sollers (up 1.81%), Kamaz (up 0.10%), and Avtovaz (up 4.87%) all finished the day higher than where they started. Unfortunately the same couldn’t be said for property developers LSR Group (down 4.20%) and Pik Group (down 6.06%), while RusHydro (down 1.31%) eased lower.